Michael beat me to commenting on the Sunday readings this week, but I had written up some thoughts already, so I thought I’d post them anyway. Unlike the other Gospels, John recounts only a limited number of miracles of Jesus, which he designates as “signs.” Although John tells us of only a few miracles, he describes them in much greater depth than the other gospels. This is quite evident in this weekend’s Gospel reading, in which we get a very lengthy description of all the events surrounding the resurrection of Lazarus. The the Raising of Lazarus is the sixth of the seven “signs” of the Gospel of John. The signs seem to escalate as the Gospel progresses. The healing of the man born blind was pretty impressive, but raising Lazarus tops it. The Gospel is building toward the seventh and final sign. Most study bibles will have notes in the margin or the bottom of the page informing the reader that this passage from Ezekiel has nothing to do with resurrection from the dead, but only pertains to the restoration of the national hopes of Israel. It is true that it pertains to the national hopes of Israel, as Michael points out below. However, the ancient manuscripts of Ezekiel were circulated without the notes in the RSVCE2 or NAB, etc., and the ancient readers tended to assume that, since the text explicitly describes resurrection from the dead, it actually concerns the resurrection of the dead. The issue has to do with God’s promises to Israel. Many Israelites were nearing death in exile and realizing that they would never see the fulfillment of God’s covenant promises personally. So was their faith in God meaningless? The point of Ezekiel’s vision is this: If he has to, God will drag your sorry self out of your graves in order to fulfill his covenant promises to you, so your faith is not in vain! The Psalm, the famous Psalm 130 (De Profundis), dovetails with the theme of resurrection. “Out of the depths I cry to you, O LORD!” What depth is deeper than death? 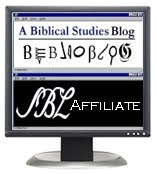 God’s salvation reaches to the realm of the dead, the biblical Sheol, the lowest level of biblical cosmology. The Second Reading, from Romans 8:8-11, continues the theme of resurrection from the dead. St. Paul speaks first of spiritual life and death: to be in sin is spiritual death; to be in Christ is to be alive. But the spiritual reality has implications for physical reality. Christ “will give life to our mortal bodies also.” The Church continues, obstinately, to believe not just in the resurrection of the “dead,” but the resurrection of the “body.” Our disembodied spirits wearing halos and playing harps on clouds is a non-Christian vision. While the next life retains many mysteries, but we can be sure we will have a new body. When Jesus hears of the illness of Lazarus, he actually delays his travel to Bethany, because he loves the whole family! So we see that the death and resurrection of Lazarus is a “premeditated” act of Jesus’ love. By the time Jesus arrives in Bethany, Lazarus has been dead four days. As many have pointed out, in Jewish understanding the first three days of death were an intermediate state, in which the soul stayed close to the body. But after three days, death was final. It's a bit like Billy Crystal’s routine when examining the dead body of Westley in The Princess Bride. “There’s a big difference between mostly dead and all dead!” In this case, Lazarus is all dead. Jesus: "Do you believe this?" Martha: ‘Yes, Lord. I have come to believe that you are the Christ, the Son of God, the one who is coming into the world”! Home run, Martha! I want to be like her. This is a confession that ranks with that of Peter and Thomas in other parts of the Gospels. Which raises an interesting question: does the text of John 11 suggest that the resurrection of Lazarus is in part a response to Martha’s faith-filled request? Feel free to share opinions in the comments. In response to Mary’s weeping and that of the other mourners, Jesus becomes “perturbed”—in verse 33 and also 38. The Greek word used here (embrimaomai) is very strong—“he became angry within himself.” What is the cause of Jesus’ anger? The brute fact of death in a fallen, sinful world? A lack of faith among the mourners? I have yet to come to a satisfactory answer to this question. Feel free to share ideas in the comments. Our Lord points out that her worries are in contradiction to her expression of faith only a few minutes earlier. Then, with the voice of command that befits one is none other than YHWH incarnate, he orders Lazarus to come out of the grave. So he comes, still partially mummified with the burial cloths. The calling forth of Lazarus, as dramatic as it is, remains only a miracle in the physical order. The greater miracles are in the realm of the spirit. Though it may not seem so to us, the redemption of the world is a greater act than its creation. 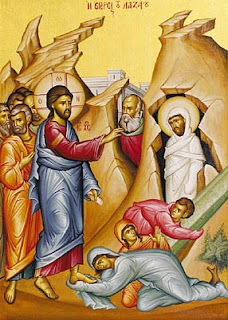 The raising of Lazarus, like the previous Lenten gospels from John (chs. 4, 9) points to Baptism. Rom. 6:1 What shall we say then? Are we to continue in sin that grace may abound? 2 By no means! How can we who died to sin still live in it? 3 Do you not know that all of us who have been baptized into Christ Jesus were baptized into his death? 4 We were buried therefore with him by baptism into death, so that as Christ was raised from the dead by the glory of the Father, we too might walk in newness of life. Rom. 6:5 For if we have been united with him in a death like his, we shall certainly be united with him in a resurrection like his. 6 We know that our old self was crucified with him so that the sinful body might be destroyed, and we might no longer be enslaved to sin. 7 For he who has died is freed from sin. 8 But if we have died with Christ, we believe that we shall also live with him. 9 For we know that Christ being raised from the dead will never die again; death no longer has dominion over him. 10 The death he died he died to sin, once for all, but the life he lives he lives to God. 11 So you also must consider yourselves dead to sin and alive to God in Christ Jesus. Rom. 6:12 Let not sin therefore reign in your mortal bodies, to make you obey their passions. 13 Do not yield your members to sin as instruments of wickedness, but yield yourselves to God as men who have been brought from death to life, and your members to God as instruments of righteousness. 14 For sin will have no dominion over you, since you are not under law but under grace. Is it possible that Jesus is feeling guilty for not being there? I think that is a pretty common human experience of loss, that we (usually irrationally) blame ourselves for not doing something that would have (in our minds) prevented the tragedy from occurring. I think he might blame himself in a way and that influences his decision to do something about it. I have been looking for a source (e.g. Rabbinical writings) that confirm this traditional Jewish understanding about the first three days after death. Would you be able to find them? The Lord Jesus Christ, being fully human, experienced many feelings that we also have. It is hard to determine which ones are tainted by sin or not, and this possibility you suggest might be right, but also seems to create problems. The man Jesus feeling guilty? Well, I don't know. As for your last statement, it seems to be contradicted by the fact that Christ intended to resurrect Lazarus even before his friend died, as the Johannine account clearly conveys. Father Moloney, in his Sacra Pagina commentary on John thinks that Martha is exhibiting "arrogance." He sees no substantial change in her attitude between verses 24 and 27.He gives the perfect tense of pisteuein (pepisteuka) its full force. "Most commentators either do not not the tense or explain it away as characteristic use of pisteuein in the Fourth Gospel (e.g., Barrett, Gospel, 396). The interpretation given here does not accept this veiw, claiming that pepisteuka is a genuine perfect tense indicating that Martha came to the faith she expresses in this verse before Jesus' words on the Resurrection and life in vv.25-26. This also explains why no reference is made to Jesus' self-revelation. That is new, but Martha boasts of having already arrived at faith and thus does not take it into account." An appropriate comment on this Gospel: “But even the raising of the dead to life, the miracle by which a corpse is reanimated with its natural life, is almost nothing in comparison with the resurrection of a soul, which has been lying spiritually dead in sin and has now been raised to the essentially supernatural life of grace.” Fr. Reginald Garrigou-Lagrange, OP, The Three Conversions in the Spiritual life (Rockford, Ill.: TAN, 2002), 15. Thus we understand why Jesus treats his own signs in the Gospel of John as penultimate manifestations of divine power.